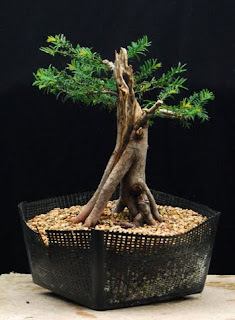 This English Yew (Taxus bacata) is starting to look like a tree with a future. This came from a comercial garden store as a clipped pyramid, reduced down to £5 due to poor health... no wonder, vine weevil grubs were eating the roots! The tree was bare rooted, the grubs killed by hand and was planted in a pond basket and very open substrated to encourage vigorous root growth. 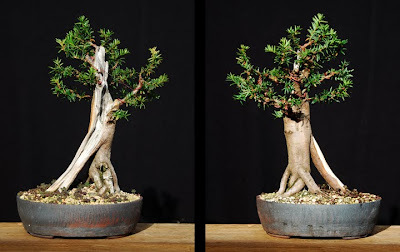 Less than 2 years on it is inthis gorgeous pot and has been fully styled, now I just need to build ramification of the branch structure.